THIS WEEK marks the 81st anniversary of the opening of the Pulaski Skyway Bridge – a milestone for what was once a modern span supporting commuters, freight and commerce. While the bridge is finally receiving much needed attention to prevent it from literally falling down, its condition highlights a serious local, regional and national problem. The fact is the average bridge in the United States was built to last 50 years and tens of thousands of them, like the Pulaski Skyway Bridge, are approaching or exceeding that lifespan. In New Jersey, as across the nation, approximately one in four bridges is structurally deficient or functionally obsolete. We saw what happens if we ignore deterioration when the I-5 Bridge north of Seattle collapsed, crimping international traffic and costing hundreds of millions of dollars in lost commerce. Before that, in Minnesota, 13 people were killed and 145 others injured when the I-35 bridge collapsed. Lesser publicized are the 25 bridges on average in the U.S. that collapse every year. With the current federal Highway Bill set to expire in less than a year, we won’t be able to afford all the urgently needed investments without Congress doing their part. The ideas are plentiful. There’s indexing the gas tax user fee to replenish the Highway Trust Fund, creating infrastructure banks that feed public-private partnerships or the recently introduced Bridge Act, which would begin to allocate the needed investment for our bridges. For decades what has been lacking has been action, due to a partisan freeze on legislating – but there are signs of a thaw. Former Transportation Secretary Ray LaHood and U.S. Chamber of Commerce President Tom Donohue both agree that adjusting and indexing the gas tax will help rescue our nation’s Transportation Trust Fund from the brink of insolvency. Both are Republicans. It’s been more than two decades since the last addition of 4.3 cents in 1993, which has been more than wiped out because Congress failed to index the rate to inflation. Doing so would have added another $215 billion, which alone would not solve the crisis, but would have been a start. Maintaining our nation’s highway system has not historically been a partisan issue. Our interstate highways were first built under Republican President Dwight Eisenhower. President Ronald Reagan himself advocated and won a gas tax increase to take care of our highways and bridges. 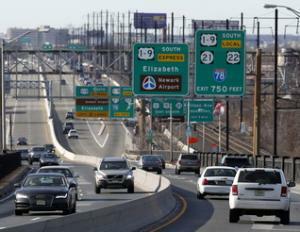 Every year we wait, New Jersey area drivers are forced to pay a much higher price than any gas tax. The economic cost of our crumbling infrastructure is about $3.1 trillion in GDP, $1.1 trillion in trade and 3.5 million in jobs by 2020. On an individual basis, the average New Jersey motorist wastes $601 a year on fuel and repairs due to the deterioration of our roadways. Just a dime’s worth of difference now could mean a total annual savings of more than $250 million throughout the state. Building and maintaining our transportation systems won’t just make us safer. It will create sorely needed jobs. States with the best performing infrastructure have seen some of the highest increases in job creation. For example, Colorado, which ranked eighth in bridge quality, experienced some of the fastest job growth in the nation, including the third best percentage in jobs increase in construction. These are jobs that are unlikely to be outsourced to workers in other countries. Our bridges – as with our nation’s entire critical infrastructure – were once the envy of the world. They were built through both the sweat and toil of laborers with a grand vision of what America can be. It is sad to see this proud legacy fall into such disrepair. Our country needs a long-term strategy for investing in its backbone. Doing so will drive our economy, keep us globally competitive, create jobs and restore us to the ranks of nations with the most advanced infrastructure. But we’ll have to take ideas and turn them into action. Let’s say Happy Birthday to the Pulaski Skyway Bridge – but let’s also offer it and other deficient bridges real solutions, not just duct tape to mark the occasion.